If you need lockers but don’t have the time or resources to spend on assembly and installation, pre-assembled lockers are a great solution. After assembly at the factory, the lockers are shipped directly to you—all you have to do is set them in place. The lockers are appropriate for a wide variety of storage applications and are available with four openings to choose from: single (wardrobe), double, triple, and six-tier (box lockers). 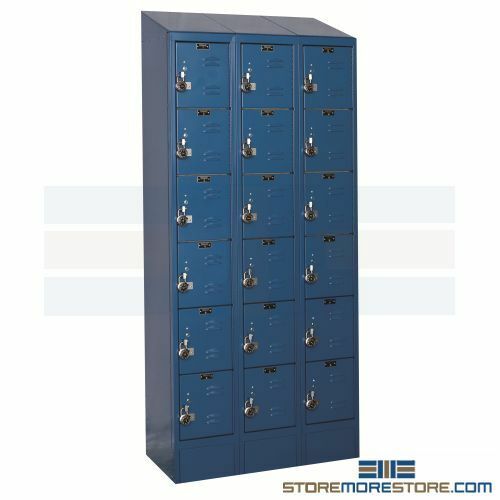 We recommend purchasing the lockers in a three-wide group for the best value, but you can purchase single units as well. Optional sloped tops are also an easy way to keep your lockers looking neat and clean, as they prevent anyone from placing items or trash on the top of the locker. 24 gauge steel locker body construction. 16 gauge steel doors (six high lockers are 18 gauge) with louvers for ventilation. Continuous piano hinges increase durability and prevent tampering. 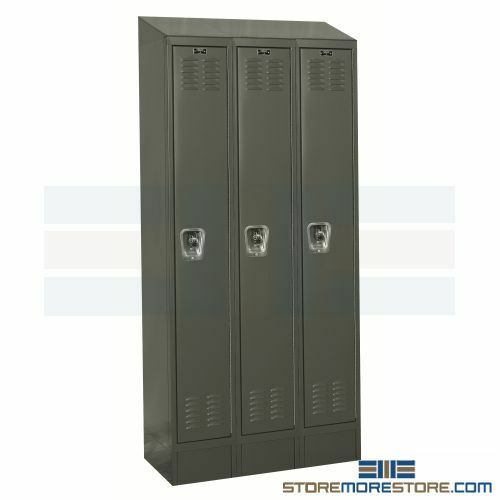 Single, double, and triple-tier lockers come with stainless steel recessed handles to prevent damage from padlocks. Handles use gravity lift-type hatches. Six-tier lockers include a catch door pull. Each locker includes a combination padlock. Single and double-tier lockers include one double prong ceiling hook and two single-side wall hooks per tier. Triple-tier lockers include one double prong ceiling hook. Lockers include black number plates with silver etched numbers in sequence starting from #1. Contact us for custom number sequencing. 6″ legs included as a standard. Lockers without legs are available for an additional cost. Sloped top lockers come with 6″ high front and side closure bases, which prevents debris from gathering under the lockers. Slope tops prevent items from accumulating on top of the lockers and can be purchased as optional items for standard flat top lockers. Available in gray, blue, and parchment finishes and coated with a zinc/iron phosphate solution to prevent corrosion, then electrostatically sprayed and baked at 350 degrees. Lockers ship fully assembled and ready to use. Two-year manufacturer’s warranty covering defects in materials and workmanship. Click here to shop for pre-assembled lockers online. Allow 5-7 business days for shipping. For further assistance, call us at 1-855-786-7667 or send us a message to speak to one of our specialists.